The D’OXYVA® device is a simple, commercially- available device to deliver transdermal carbon dioxide (CO2). 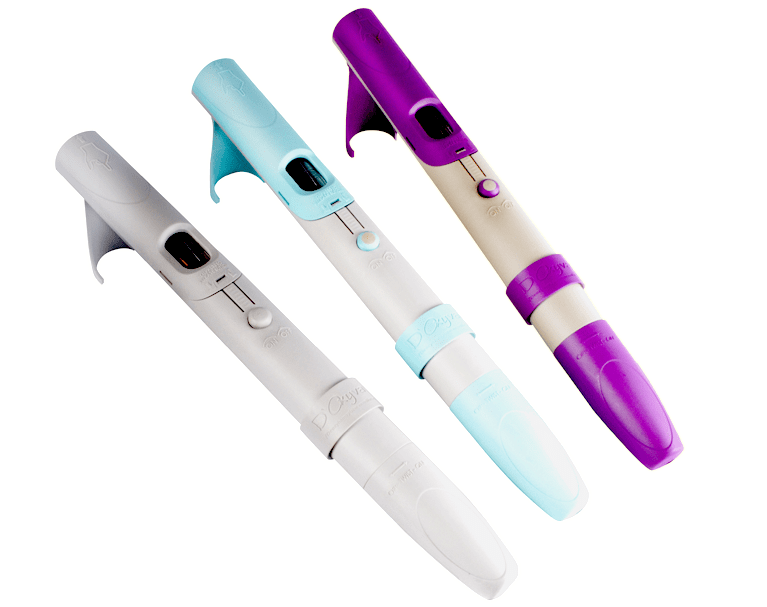 It consists of a patented and patent-pending ergonomic polymer shell that is propelled by a patented single-use mini steel pressurized cartridge (45 psi) filled with pharmaceutical-grade (99.5%) liquid, purified CO2. The mini-steel cylinder is GMP-compliant, and recyclable. D’OXYVA was identified by the IRB in a human clinical trial as a non-significant risk (NSR) device. The D’OXYVA device is manufactured in the United States and other countries. D’OXYVA is an ISO-complaint device, which means that Circularity Healthcare, LLC has received a certification to certify that D’OXYVA fulfills all of the international requirements for medical device regulations, like risk assessment and maintaining effective processes for safe design, manufacture and distribution.manufacture and distribution. WHO IS INVOLVED IN IMPROVING HEALTHCARE FOR PATIENTS? CO2 is the protagonist in D’OXYVA’s revolutionary approach to improving healthcare and patients’ quality of life. The medical device causes controlled ischemia-like stress in a local area of the body to promote central nervous system activity and circulate humoral agents that favor micro-circulation, especially at the organ capillary beds. Adequate blood flow in the capillary bed is essential for tissue survival and optimal organ function. If blood passes too fast or does not pass at all, the tissue cannot extract O2 efficiently and will generate what is known as capillary dysfunction, which is related to chronic pain, poor wound healing, diabetic neuropathy and Alzheimer’s disease, among other conditions. WHAT DO WE USUALLY REMEMBER ABOUT CO2? · It is a key player in regulating extracellular hydrogen concentrations and pH through various systems, like the respiratory system, kidneys and various buffers. · Biochemistry: An increase or decrease in 1 mmHg pCO2 will cause a decrease or increase in pH of 0.08 units in acute patients. In chronic patients, a pCO2 change of 1 mmHg will cause a pH change of 0.03 units. · The Bohr and Haldane effects determine the interaction of O2 and CO2. At the cellular level, pCO2 concentration causes Hb-O2 dissociation. · It is attained by our body through inhalation. WHAT DO WE USUALLY FORGET ABOUT PCO2? · Increased pCO2 promotes arteriolar dilatation in various tissues, while a modest effect has been shown in skeletal muscle tissues. · CO2 can be delivered into our body through the skin (transdermal). · Tissue-freezing techniques (as dry ice) and to destroy warts by freezing. · The CO2 concentration increment potentiates the S-shaped hemoglobin (Hb) to O2 dissociation curve. It helps Hb to unload O2 from 40% O2 dissociation under normal conditions to 70% O2 dissociation under increase CO2 concentration. WHERE DOES CO2 VAPOR DELIVERED THROUGH THE SKIN TAKE ACTION IN THE BODY? Transdermal delivery of CO2 has proved to improve local microcirculation (capillary beds) blood flow and tissue perfusion, but it also positively improves systemic blood pressure and TcpO2 (most likely due to the Bohr effect). As mentioned before, therapeutic medical-grade CO2 is used for vasodilatation in the medical field for several conditions and procedures. We are currently finding clinical researchers who are interested in participating in clinical trials with our medical device. Our goal is to produce scientific evidence of D’OXYVA’s potential to improve healthcare. More than two dozen research projects have been performed to test D’OXYVA potential and its capability to help patients obtain wellness. We have tested the efficiency, tolerability and safety of the D’OXYVA medical device in delivering a gentle, highly concentrated CO2 mist to the body through the skin and prove the reproducibility of its effects beyond doubt. To do so, we measured body CO2 concentration before and after treatment as well as the expected physiological response to CO2 treatment. In addition, we have partnered with healthcare leaders and clinicians to perform independent research studies. 1) Safety and tolerability  Up to date, no adverse side effects or negative healthcare responses have been recorded from our clients using D’OXYVA. Also, no participants in our research projects had any documented side effects from treatment. We encourage you to discuss with your healthcare professional if D’OXYVA medical device is right for you. · Up to date, no adverse side effects or negative healthcare responses have been recorded from our clients using D’OXYVA. Also, no participants in our research projects had any documented side effects from treatment. We encourage you to discuss with your healthcare professional if D’OXYVA medical device is right for you. · Within the first 5 minutes of D’OXYVA treatment, TcPCO2 increases in the body, followed by a decline slope that lasts approximately 240 minutes until returning to baseline values. · In healthy individuals, D’OXYVA does not increase pCO2 beyond the body buffer’s manageable range, making it completely safe. · The results of each research project consistently showed a significant increment on PI in 100% of participants within the first 5 minutes of treatment, peaking at 60 minutes after treatment. From 60 minutes after treatment until 240 minutes (our largest time period evaluated after treatment), PI decreased slowly to baseline levels. PI studies on diabetic patients has demonstrated a greater response to CO2 that in non-diabetic healthy individuals. Our studies have recorded that the PI change (from baseline) in diabetic patients was double the PI change recorded in healthy patients (Graph 1).  D’OXYVA has consistently reported increased free O2 molecules in our patients’ blood streams. The effective transdermal CO2 delivery allows the body to increment O2 availability through the Bohr effect, which helps hemoglobin cells to unload O2 more easily by decreasing its affinity. All of the research projects performed up to date have consistently recorded a significant decrease in systolic blood pressure (from the heart) and diastolic (return to the heart) blood pressure. These results have been consistent throughout all study time periods up to 240 minutes (our longest time period evaluated after treatment). A research project focusing on D’OXYVA’s impact on diabetic ulcers recorded significant changes in wound healing, like significant granulation of tissue and improved ulcer borders, as soon as 1 week into the D’OXYVA treatment plan (Image 1). Amateur and professional athletes are always searching for ways to improve cardiovascular function and increase the vascular transport capacity of skeletal muscle. Better vascular transport capacity translates to more O2 and nutrients delivered to our muscles, which means better performance in the field. D’OXYVA research focusing on the perfusion index (PI) of superficial skeletal muscles has recorded excellent results. The most important findings demonstrate that participants who use D’OXYVA doubled their PI in comparison to the control group. Use of D’OXYVA has consistently been shown to improve local cellular homeostasis. It has the potential to improve body pH values by promoting an alkaline ambiance. A slightly alkaline microenvironment After 7 days of treatment with D’OXYVA (1x per day) – same wound dressing as before within the body promotes good health and optimal body organ performance. WHEN WILL PATIENTS BEGIN TO PERCEIVE HEALTHCARE BENEFITS AFTER STARTING D’OXYVA? The SENTEC digital monitor system has confirmed successful and constant CO2 transdermal delivery to the skin capillary bed after a 5-minute period of exposure to highly concentrated CO2 vapor produced by D’OXYVA. The perceived healthcare benefits occur almost instantly, with local microcirculation improvements followed by an increment of SPO2 that last up to 240 minutes. Nonetheless, adherence to a D’OXYVA regiment has demonstrated benefits to individuals suffering from difficult-to-heal skin wounds like diabetic ulcers, who demonstrated significant clinical improvements after two weeks of D’OXYVA. Patients who achieved D’OXYVA device adherence for more than a month have shown wellness that persists in clinical trials. · It has natural anti-inflammatory characteristics. · It increases blood flow through microcirculation, by arteriolar/venous dilatation. · It produces a rightward shift in the O2 dissociation curve. · It enhances oxygen delivery at the cellular level in the muscles, organs, brain, skin and other parts of the body. · It is a fat-dissolving compound. · It naturally sedates and calms the central nervous system. · It can be used to reconstruct functionally closed capillaries. · It can improve venous response. · It improves blood-flow properties.  It can be used to sedate the central nervous system. IS D’OXYVA SAFE FOR MY PATIENTS (HUMANS AND PETS)? Circularity Healthcare operates a state-of-the-art supply chain and quality management system (QMS) for manufacturing. Circularity has certificates of registration for IS EN ISO13485:2012 (European Union) and ISO13485:2003 under CMDCAS (Canada), which it has been implementing since 2013. D’OXYVA is a CE-marked medical device (Class I, low risk) for delivery of medications via the skin. Circularity is seeking approval from the U.S. FDA and other countries for delivery of medical gases such as medical carbon dioxide (USP UN1013) via a novel, patented, non-invasive transdermal route with D’OXYVA to treat various widespread conditions. Medical carbon dioxide is manufactured and delivered under applicable standards per each country’s regulatory requirements. In the United States, the Food and Drug Administration has cleared the use of medical carbon dioxide through inhalation for humans but not yet through transdermal delivery with D’OXYVA. Transportation of medical carbon dioxide via any postal or courier service requires a certification for handling dangerous goods (HAZMAT) by the U.S. Department of Transportation (DOT). Next post: How does Poor Blood Circulation Affect your Skin?